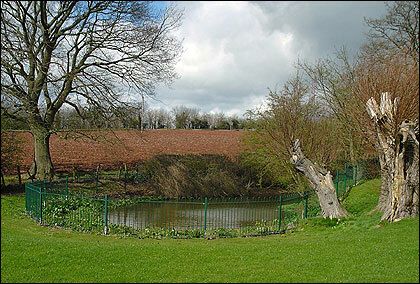 Close to Gadfield Elm Chapel is Hill Farm, the historic LDS Church History site of 'Benbow's Pond'. Hill Farm was originally the homestead of John and Jane Benbow who played a pivotal role in the conversion and baptism of all but one of the 600 members of the United Brethren's congregation, culminating in the bequeathing of Gadfield Elm Chapel to The Church of Jesus Christ of Latter-day Saints in June of 1840. At the pond near the Hill Farm farmhouse, Wilford Woodruff baptised the first of these converts on March 6th 1840, many of which ultimately migrated to the Western United States helping to settle parts of Utah, California and Arizona. Today, the pond is owned by The Church of Jesus Christ of Latter-day Saints and is available to visit. As you do so, please be considerate to the residents of Hill Farm which is a working farm that is not owned by the church. Hill Farm can be found just off the B4214 just south of Castle Frome, England at co-ordinates 52.104153,-2.479043 or at PostCode HR8 1HL.